If you are NOT a member of World-Voices Organization, click the blue Register button below, enter your email address, and then select "NON-Member"
If you are a MEMBER of World-Voices Organization Inc., click the blue Register button below, enter your email address and then select "Member"
Voiceover Goes High Tech at the MiniCon: Silicon Valley! The WoVO® MiniCon: Silicon Valley is happening April 27-28, 2019 in the San Francisco Bay Area. We’re taking advantage of our proximity to some of the high tech giants we all use to build and market our small businesses. 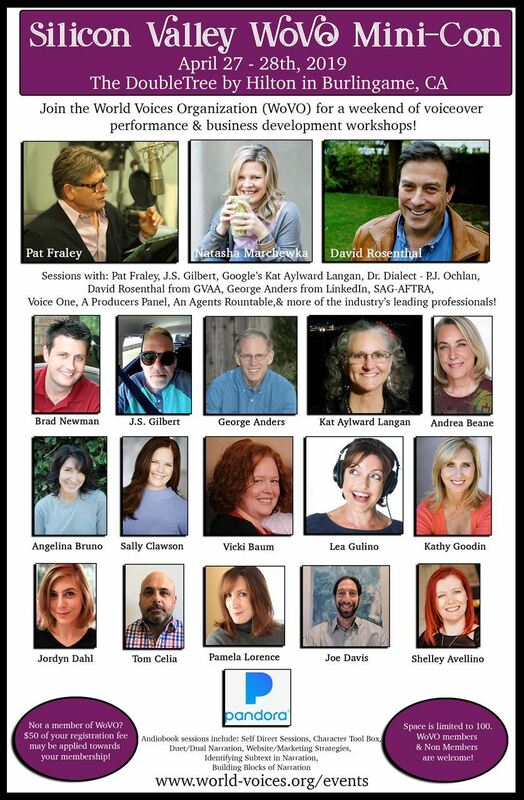 We'll also have a Producers Panel, an Agents Round-table, and more of the industry's leading professionals. WoVO® members and non-members are welcome! Not a member of WoVO? $50 of your registration fee may be applied towards your membership! We’ve secured the DoubleTree San Francisco Airport with a great room block rate close to SFO with a free shuttle to and from the airport. You can reserve your room by calling the DoubleTree In-House Reservations Department at 650-344-5500 and referencing code “WOV”. More details and a complete schedule coming soon.